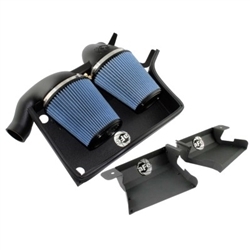 The aFe cold air intake system is made of a plastic rotational molded intake tube for lower temperature and increased air flow. It also utilizes a wrinkle black heat shield that separates the intake system from the engine. This kit includes two aFe Pro 5R Filters for maximum airflow. Also included are two air scoops that bolt directly into the BMW front kidneys. The intake produced 27hp and 34 lbs. x ft. of torque to the wheels.